Some say that we should avoid soy altogether for the best health, while others argue that fermented soy products are actually really beneficial to health. I have decided, that although miso is not suitable for the elimination stages of the autoimmune protocol diet (sorry, guys), it does have a place in a healthy diet - and even a paleo or clean eating diet. 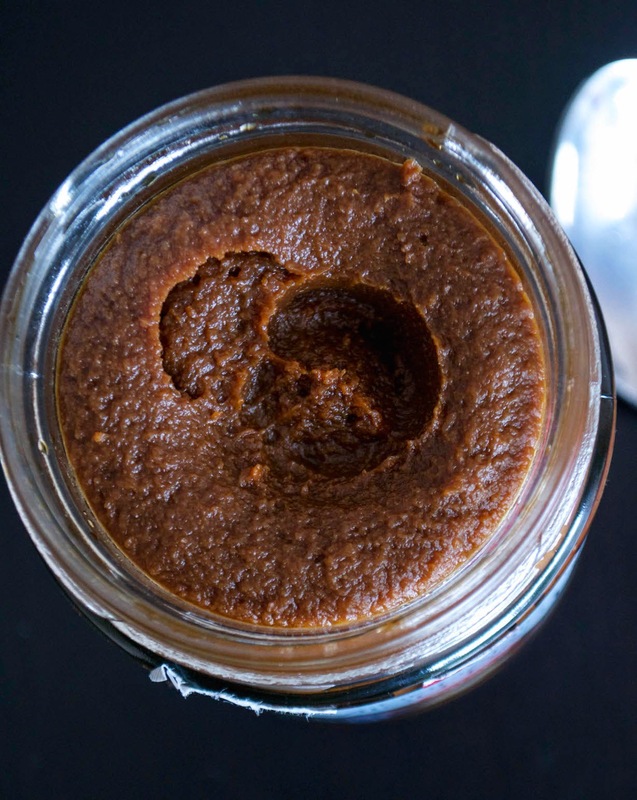 Have a look at Eat Drink Paleo's blog post on miso, where it's argued that miso contains beneficial bacteria (because of the fermentation process), vitamins and minerals and is a good source of protein. Now. 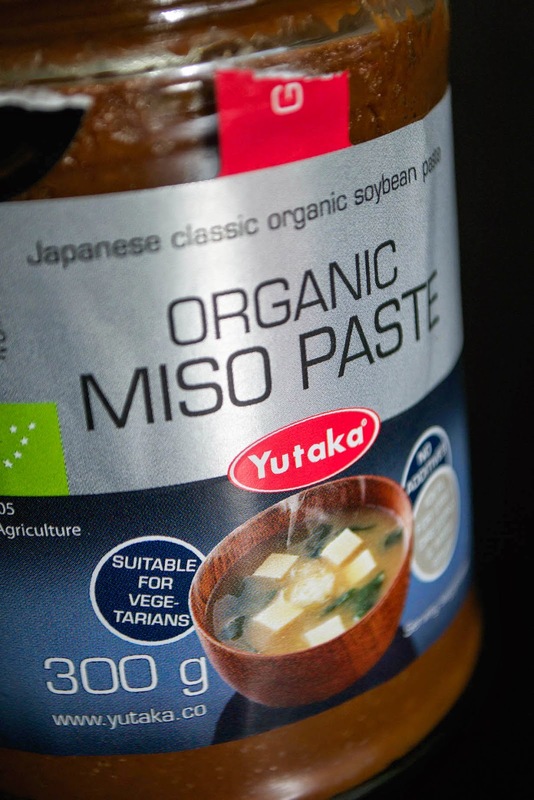 The most obvious thing to do with a jar of miso paste would be to make miso soup. But I wanted to do something a little different, so I made a marinade with it. It was GORGEOUS. 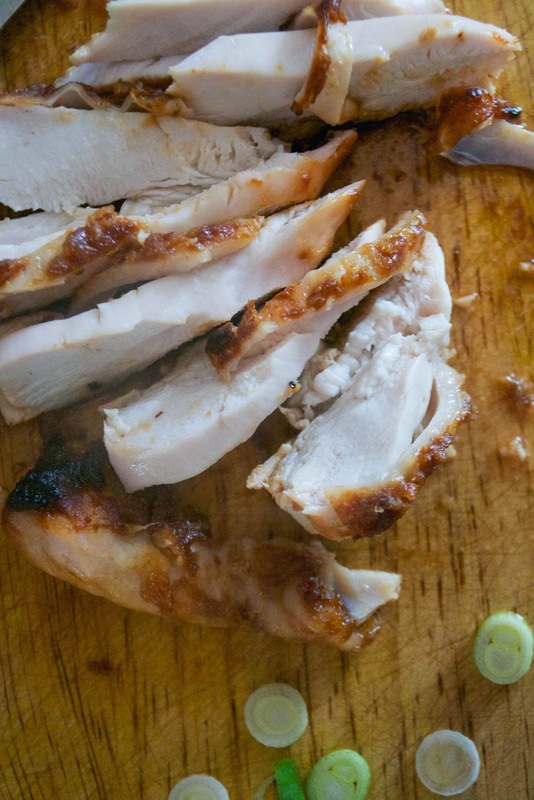 There was an intense savoury and also kind of sweet flavour, and the marinade gave the skin of the chicken a beautiful burnished, deep amber colour. It's also relatively fuss-free to make. Quickly stir it together, slap it on the chicken and then roast it. It would be gorgeous with a pile of fluffy, white rice alongside too, although we stuck with stir-fried shredded Brussels Sprouts, which caramelised and turned golden as they sizzled in the pan. We're defo having this again. First, prepare the chicken. Take the chicken breasts out of the fridge. 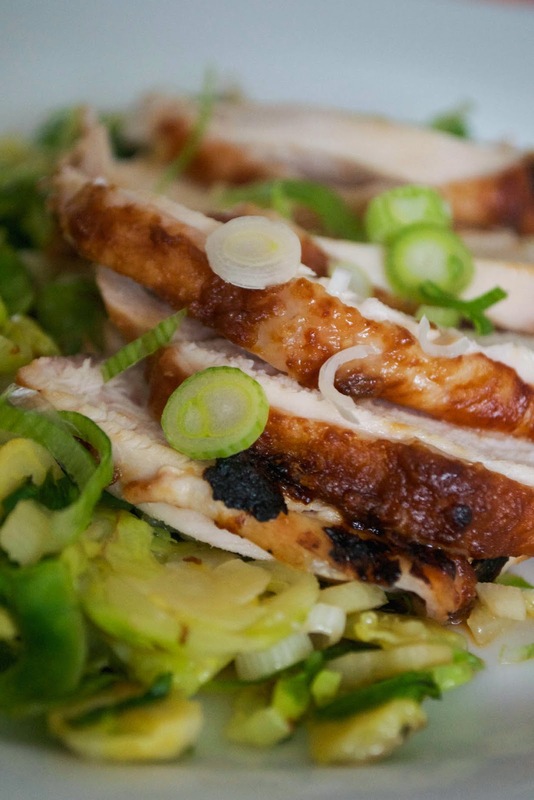 In a large bowl that will hold the chicken, mix together the miso paste, mirin, lime juice, ginger and garlic. Slather this mixture all over the chicken - underneath the fillets as well as over the skin. Place the chicken in the marinade and cover with cling film. Keep in the fridge for 1 hour. Preheat the oven to 200ºC/gas mark 6/400ºF. Lay the chicken breasts out on a roasting tray (lined with foil) and slide into the oven to roast for about 15-20 minutes. Once the chicken is cooked thoroughly (cut into a piece to make sure) take it out of the oven and leave to rest for a few minutes. To make the stir-fried Brussels Sprouts, quickly shred the sprouts with a sharp knife and heat the coconut oil in a pan. Add the sliced sprouts, the garlic and the spring onions and stir-fry for 3-4 minutes, until the greens are tender and starting to turn golden. 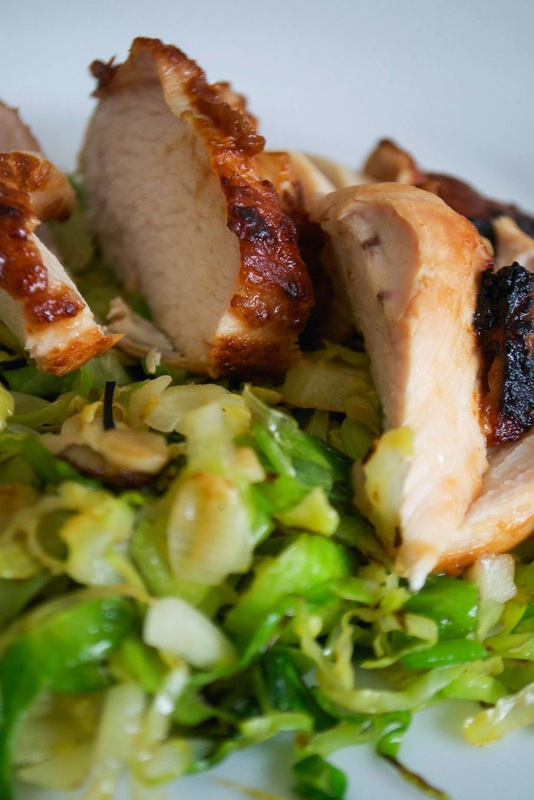 When everything's ready, slice the chicken breasts and serve with the greens. Sprinkle with some extra chopped spring onion over the top. Beautiful with a cup of green tea alongside. Thanks to Yutaka, who sent me the jar of miso paste to try.